Beer and a game of checkers, what better way to spend an afternoon before the game starts. We are combining our two shops on this one and offering a special gift set. 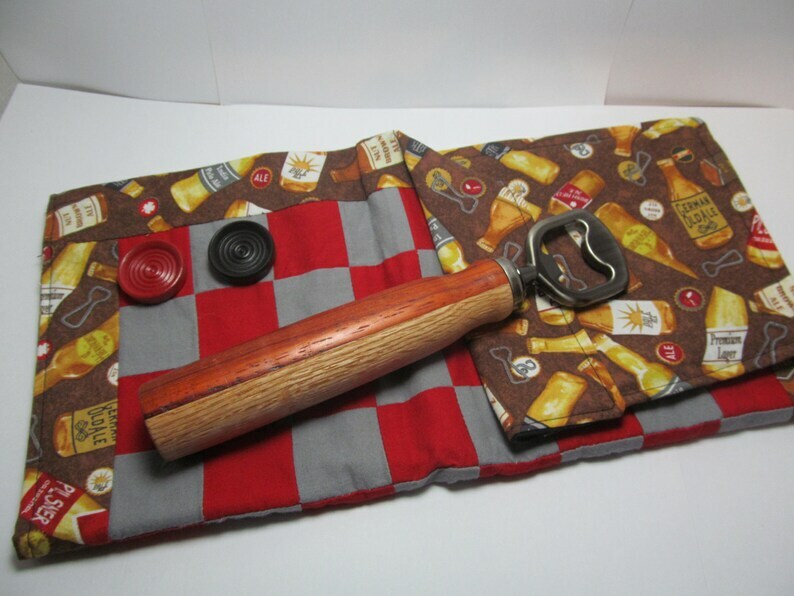 A Beer themed Tailgate Checker Board With a Bottle Opener. This is a fabric travel checkerboard, comes with a full set of red and black checkers that fit right inside. The bag (aka the checkerboard) has Velcro to keep it secure, but nothing will get out when the board is folded. Chess pieces are also available for an additional $7. Or order with just Chess pieces for an additional $5. Bottle Opener Measures Approximately 6" long and is made from Oak and Paduak for a contrasting look. Hardware features a Pewter finish. Items are shipped USPS Priority Mail with tracking. If you are in the Loudoun County,VA area please contact us about local pick up or delivery before placing your order.